In finance, a derivative is a contract that derives its value from the performance of an underlying entity. This underlying entity can be an asset, index, or interest rate, and is often simply called the "underlying." Derivatives can be used for a number of purposes, including insuring against price movements (hedging), increasing exposure to price movements for speculation or getting access to otherwise hard-to-trade assets or markets. Some of the more common derivatives include forwards, futures, options, swaps, and variations of these such as synthetic collateralized debt obligations and credit default swaps. Most derivatives are traded over-the-counter (off-exchange) or on an exchange such as the New York Stock Exchange, while most insurance contracts have developed into a separate industry. In the United States, after the financial crisis of 2007–2009, there has been increased pressure to move derivatives to trade on exchanges. Derivatives are one of the three main categories of financial instruments, the other two being stocks (i.e., equities or shares) and debt (i.e., bonds and mortgages). The oldest example of a derivative in history, attested to by Aristotle, is thought to be a contract transaction of olives, entered into by ancient Greek philosopher Thales, who made a profit in the exchange. Bucket shops, outlawed a century ago, are a more recent historical example. 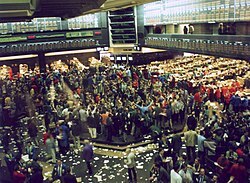 According to the Bank for International Settlements, who first surveyed OTC derivatives in 1995, reported that the "gross market value, which represent the cost of replacing all open contracts at the prevailing market prices, ... increased by 74% since 2004, to $11 trillion at the end of June 2007 (BIS 2007:24)." Positions in the OTC derivatives market increased to $516 trillion at the end of June 2007, 135% higher than the level recorded in 2004. The total outstanding notional amount is US$708 trillion (as of June 2011). Of this total notional amount, 67% are interest rate contracts, 8% are credit default swaps (CDS), 9% are foreign exchange contracts, 2% are commodity contracts, 1% are equity contracts, and 12% are other. Because OTC derivatives are not traded on an exchange, there is no central counter-party. Therefore, they are subject to counterparty risk, like an ordinary contract, since each counter-party relies on the other to perform. see also "What are Asset-Backed Securities?". SIFMA. Retrieved July 13, 2013. Asset-backed securities, called ABS, are bonds or notes backed by financial assets. Typically these assets consist of receivables other than mortgage loans, such as credit card receivables, auto loans, manufactured-housing contracts and home-equity loans. )</ref> Originally developed for the corporate debt markets, over time CDOs evolved to encompass the mortgage and mortgage-backed security (MBS) markets. Like other private-label securities backed by assets, a CDO can be thought of as a promise to pay investors in a prescribed sequence, based on the cash flow the CDO collects from the pool of bonds or other assets it owns. The CDO is "sliced" into "tranches", which "catch" the cash flow of interest and principal payments in sequence based on seniority. If some loans default and the cash collected by the CDO is insufficient to pay all of its investors, those in the lowest, most "junior" tranches suffer losses first. The last to lose payment from default are the safest, most senior tranches. Consequently, coupon payments (and interest rates) vary by tranche with the safest/most senior tranches paying the lowest and the lowest tranches paying the highest rates to compensate for higher default risk. As an example, a CDO might issue the following tranches in order of safeness: Senior AAA (sometimes known as "super senior"); Junior AAA; AA; A; BBB; Residual. A credit default swap (CDS) is a financial swap agreement that the seller of the CDS will compensate the buyer (the creditor of the reference loan) in the event of a loan default (by the debtor) or other credit event. The buyer of the CDS makes a series of payments (the CDS "fee" or "spread") to the seller and, in exchange, receives a payoff if the loan defaults. It was invented by Blythe Masters from JP Morgan in 1994. In the event of default the buyer of the CDS receives compensation (usually the face value of the loan), and the seller of the CDS takes possession of the defaulted loan. However, anyone with sufficient collateral to trade with a bank or hedge fund can purchase a CDS, even buyers who do not hold the loan instrument and who have no direct insurable interest in the loan (these are called "naked" CDSs). If there are more CDS contracts outstanding than bonds in existence, a protocol exists to hold a credit event auction; the payment received is usually substantially less than the face value of the loan. Credit default swaps have existed since the early 1990s, and increased in use after 2003. By the end of 2007, the outstanding CDS amount was $62.2 trillion, falling to $26.3 trillion by mid-year 2010 but reportedly $25.5 trillion in early 2012. CDSs are not traded on an exchange and there is no required reporting of transactions to a government agency. During the 2007-2010 financial crisis the lack of transparency in this large market became a concern to regulators as it could pose a systemic risk. In March 2010, the [DTCC] Trade Information Warehouse (see Sources of Market Data) announced it would give regulators greater access to its credit default swaps database. CDS data can be used by financial professionals, regulators, and the media to monitor how the market views credit risk of any entity on which a CDS is available, which can be compared to that provided by credit rating agencies. U.S. courts may soon be following suit. Most CDSs are documented using standard forms drafted by the International Swaps and Derivatives Association (ISDA), although there are many variants. In addition to the basic, single-name swaps, there are basket default swaps (BDSs), index CDSs, funded CDSs (also called credit-linked notes), as well as loan-only credit default swaps (LCDS). In addition to corporations and governments, the reference entity can include a special-purpose vehicle issuing asset-backed securities. Some claim that derivatives such as CDS are potentially dangerous in that they combine priority in bankruptcy with a lack of transparency. A CDS can be unsecured (without collateral) and be at higher risk for a default. In finance, a forward contract or simply a forward is a non-standardized contract between two parties to buy or to sell an asset at a specified future time at a price agreed upon today, making it a type of derivative instrument. This is in contrast to a spot contract, which is an agreement to buy or sell an asset on its spot date, which may vary depending on the instrument, for example most of the FX contracts have Spot Date two business days from today. The party agreeing to buy the underlying asset in the future assumes a long position, and the party agreeing to sell the asset in the future assumes a short position. The price agreed upon is called the delivery price, which is equal to the forward price at the time the contract is entered into. The price of the underlying instrument, in whatever form, is paid before control of the instrument changes. This is one of the many forms of buy/sell orders where the time and date of trade is not the same as the value date where the securities themselves are exchanged. A closely related contract is a forward contract. A forward is like a futures in that it specifies the exchange of goods for a specified price at a specified future date. However, a forward is not traded on an exchange and thus does not have the interim partial payments due to marking to market. Nor is the contract standardized, as on the exchange. Unlike an option, both parties of a futures contract must fulfill the contract on the delivery date. The seller delivers the underlying asset to the buyer, or, if it is a cash-settled futures contract, then cash is transferred from the futures trader who sustained a loss to the one who made a profit. To exit the commitment prior to the settlement date, the holder of a futures position can close out its contract obligations by taking the opposite position on another futures contract on the same asset and settlement date. The difference in futures prices is then a profit or loss.. The shares of subprime MBSs issued by various structures, such as CMOs, are not identical but rather issued as tranches (French for "slices"), each with a different level of priority in the debt repayment stream, giving them different levels of risk and reward. Tranches—especially the lower-priority, higher-interest tranches—of an MBS are/were often further repackaged and resold as collaterized debt obligations. These subprime MBSs issued by investment banks were a major issue in the subprime mortgage crisis of 2006–2008 . The total face value of an MBS decreases over time, because like mortgages, and unlike bonds, and most other fixed-income securities, the principal in an MBS is not paid back as a single payment to the bond holder at maturity but rather is paid along with the interest in each periodic payment (monthly, quarterly, etc.). This decrease in face value is measured by the MBS's "factor", the percentage of the original "face" that remains to be repaid. The cash flows are calculated over a notional principal amount. Contrary to a future, a forward or an option, the notional amount is usually not exchanged between counterparties. Consequently, swaps can be in cash or collateral. Swaps can be used to hedge certain risks such as interest rate risk, or to speculate on changes in the expected direction of underlying prices. OTC represents the biggest challenge in using models to price derivatives. Since these contracts are not publicly traded, no market price is available to validate the theoretical valuation. Most of the model's results are input-dependent (meaning the final price depends heavily on how we derive the pricing inputs). Therefore, it is common that OTC derivatives are priced by Independent Agents that both counterparties involved in the deal designate upfront (when signing the contract). ^ Derivatives (Report). Office of the Comptroller of the Currency, U.S. Department of Treasury. Retrieved February 15, 2013. A derivative is a financial contract whose value is derived from the performance of some underlying market factors, such as interest rates, currency exchange rates, and commodity, credit, or equity prices. Derivative transactions include an assortment of financial contracts, including structured debt obligations and deposits, swaps, futures, options, caps, floors, collars, forwards, and various combinations thereof. ^ Koehler, Christian. "The Relationship between the Complexity of Financial Derivatives and Systemic Risk". Working Paper: 10–11. SSRN 2511541. ^ Crawford, George; Sen, Bidyut (1996). Derivatives for Decision Makers: Strategic Management Issues. John Wiley & Sons. ISBN 9780471129943. Retrieved June 15, 2016. ^ a b c d e Hull, John C. (2006). Options, Futures and Other Derivatives (6th ed.). New Jersey: Prentice Hall. ISBN 978-0131499089. ^ Mark Rubinstein (1999). Rubinstein on Derivatves. Risk Books. ISBN 978-1-899332-53-3. ^ a b Koehler, Christian. "The Relationship between the Complexity of Financial Derivatives and Systemic Risk". Working Paper: 10. SSRN 2511541. ^ Kaori Suzuki; David Turner (December 10, 2005). "Sensitive politics over Japan's staple crop delays rice futures plan". The Financial Times. Retrieved October 23, 2010. ^ "Clear and Present Danger; Centrally cleared derivatives. (clearing houses)". The Economist. Economist Newspaper Ltd.(subscription required). April 12, 2012. Retrieved May 10, 2013. ^ "ESMA data analysis values EU derivatives market at €660 trillion with central clearing increasing significantly". www.esma.europa.eu. Retrieved October 19, 2018. ^ Liu, Qiao; Lejot, Paul (2013). "Debt, Derivatives and Complex Interactions". Finance in Asia: Institutions, Regulation and Policy. Douglas W. Arne. New York: Routledge. p. 343. ISBN 978-0-415-42319-9. ^ The Budget and Economic Outlook: Fiscal Years 2013 to 2023 (PDF). Congressional Budget Office. February 5, 2013. Retrieved March 15, 2013. ^ "Swapping bad ideas: A big battle is unfolding over an even bigger market". The Economist. April 27, 2013. Retrieved May 10, 2013. ^ "World GDP: In search of growth". The Economist. Economist Newspaper Ltd. May 25, 2011. Retrieved May 10, 2013. ^ Khullar, Sanjeev (2009). "Using Derivatives to Create Alpha". In John M. Longo (ed.). Hedge Fund Alpha: A Framework for Generating and Understanding Investment Performance. Singapore: World Scientific. p. 105. ISBN 978-981-283-465-2. Retrieved September 14, 2011. ^ Lemke and Lins, Soft Dollars and Other Trading Activities, §§2:47 - 2:54 (Thomson West, 2013-2014 ed.). ^ Don M. Chance; Robert Brooks (2010). "Advanced Derivatives and Strategies". Introduction to Derivatives and Risk Management (8th ed.). Mason, OH: Cengage Learning. pp. 483–515. ISBN 978-0-324-60120-6. Retrieved September 14, 2011. ^ Shirreff, David (2004). "Derivatives and leverage". Dealing With Financial Risk. The Economist. p. 23. ISBN 978-1-57660-162-4. Retrieved September 14, 2011. ^ Peterson, Sam (2010), "There's a Derivative in Your Cereal", The Atlantic. ^ Sergey Chernenko; Michael Faulkender (December 2011). "The Two Sides of Derivatives Usage: Hedging and Speculating with Interest Rate Swaps". The Journal of Financial and Quantitative Analysis. 46 (6): 1727–1754. CiteSeerX 10.1.1.422.7302. doi:10.1017/S0022109011000391. ^ Guay, Wayne R. and Kothari, S.P. (2001). "How Much do Firms Hedge with Derivatives?" ^ a b Knowledge@Wharton (2006). "The Role of Derivatives in Corporate Finances: Are Firms Betting the Ranch?" ^ a b c d Ryan Stever; Christian Upper; Goetz von Peter (December 2007). BIS Quarterly Review (PDF) (Report). Bank for International Settlements. ^ BIS survey: The Bank for International Settlements (BIS) semi-annual OTC derivatives market report, for end of June 2008, showed US$683.7 trillion total notional amounts outstanding of OTC derivatives with a gross market value of US$20 trillion. See also Prior Period Regular OTC Derivatives Market Statistics. ^ Futures and Options Week: According to figures published in F&O Week October 10, 2005. See also FOW Website. ^ "Financial Markets: A Beginner's Module". ^ Lemke, Lins and Picard, Mortgage-Backed Securities, §5:15 (Thomson West, 2014). ^ Koehler, Christian. "The Relationship between the Complexity of Financial Derivatives and Systemic Risk". Working Paper: 17. SSRN 2511541. ^ Lisa Pollack (January 5, 2012). "Credit event auctions: Why do they exist?". FT Alphaville. ^ "Chart; ISDA Market Survey; Notional amounts outstanding at year-end, all surveyed contracts, 1987-present" (PDF). International Swaps and Derivatives Association (ISDA). Archived from the original (PDF) on March 23, 2012. Retrieved April 8, 2010. ^ "ISDA 2010 Mid-Year Market Survey" Archived September 13, 2011, at the Wayback Machine. Latest available a/o March 1, 2012. ^ "ISDA: CDS Marketplace". Isdacdsmarketplace.com. December 31, 2010. Retrieved March 12, 2012. ^ Kiff, John; Jennifer Elliott; Elias Kazarian; Jodi Scarlata; Carolyne Spackman (November 2009). "Credit Derivatives: Systemic Risks and Policy Options" (PDF). IMF Working Papers (WP/09/254). Retrieved April 25, 2010. ^ a b Christian Weistroffer; Deutsche Bank Research (December 21, 2009). "Credit default swaps: Heading towards a more stable system" (PDF). Deutsche Bank Research: Current Issues. Retrieved April 15, 2010. ^ Sirri, Erik. "Testimony Concerning Credit Default Swaps Before the House Committee on Agriculture October 15, 2008". Retrieved April 2, 2010. ^ Frank Partnoy; David A. Skeel, Jr. (2007). "The Promise And Perils of Credit Derivatives". University of Cincinnati Law Review. 75: 1019–1051. SSRN 929747. ^ Mengle, David (2007). "Credit Derivatives: An Overview" (PDF). Economic Review (FRB Atlanta). 92 (4). Retrieved April 2, 2010. ^ Simkovic, Michael (2013). "Competition and Crisis in Mortgage Securitization". Indiana Law Journal. 88: 213. SSRN 1924831. ^ Lemke, Lins and Picard, Mortgage-Backed Securities, Chapters 4 and 5 (Thomson West, 2013 ed.). ^ Ross; Westerfield; Jordan (2010). Fundamentals of Corporate Finance (9th ed.). McGraw Hill. p. 746. ^ "Currency Derivatives: A Beginner's Module". ^ "Bis.org". Bis.org. May 7, 2010. Retrieved August 29, 2010. ^ "Launch of the WIDER study on The World Distribution of Household Wealth: 5 December 2006". Retrieved June 9, 2009. ^ Boumlouka, Makrem (October 30, 2009). "Alternatives in OTC Pricing". Hedge Funds Review. ^ Raghuram G. Rajan (September 2006). "Has Financial Development Made the World Riskier?". European Financial Management. 12 (4): 499–533. doi:10.1111/j.1468-036X.2006.00330.x. SSRN 923683. ^ Kelleher, James B. 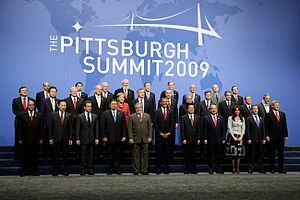 (September 18, 2008). ""Buffett's Time Bomb Goes Off on Wall Street" by James B. Kelleher of Reuters". Reuters.com. Retrieved August 29, 2010. ^ Whaley, Robert (2006). Derivatives: markets, valuation, and risk management. John Wiley and Sons. p. 506. ISBN 978-0-471-78632-0. ^ "UBS Loss Shows Banks Fail to Learn From Kerviel, Leeson". Businessweek. September 15, 2011. Retrieved March 5, 2013. ^ Story, Louise, "A Secretive Banking Elite Rules Trading in Derivatives", The New York Times, December 11, 2010 (December 12, 2010, p. A1 NY ed.). Retrieved December 12, 2010. ^ a b Proskauer Rose LLP. "SEC and CFTC oversight of derivatives: a status report". Lexology. Retrieved March 5, 2013. ^ Younglai, Rachelle. "Interview – Not all SEC, CFTC rules must be harmonized". Reuters. Retrieved March 5, 2013. ^ "First take: Ten key points from the SEC's swaps reporting and disclosure rules" (PDF). PwC Financial Services Regulatory Practice, February 2015. ^ a b c d "Joint Press Statement of Leaders on Operating Principles and Areas of Exploration in the Regulation of the Cross-Border OTC Derivatives Market; 2012-251". Sec.gov. December 4, 2012. Retrieved March 11, 2016. ^ "Derivatives: A first take on cross-border comparability" (PDF). December 2013. ^ a b c d e "DTCC's Global Trade Repository for OTC Derivatives ("GTR")". Dtcc.com. Retrieved March 5, 2013. ^ "U.S. DTCC says barriers hinder full derivatives picture". Reuters. February 12, 2013. Retrieved March 5, 2013. ^ Release, Press (August 5, 2010). "Derivatives trades will be tracked by Depository Trust". Futuresmag.com. Retrieved March 5, 2013. Söhnke M. Bartram; Brown, Gregory W.; Conrad, Jennifer C. (August 2011). "The Effects of Derivatives on Firm Risk and Value" (PDF). Journal of Financial and Quantitative Analysis. 46 (4): 967–999. doi:10.1017/s0022109011000275. SSRN 1550942. Söhnke M. Bartram; Kevin Aretz (Winter 2010). "Corporate Hedging and Shareholder Value" (PDF). Journal of Financial Research. 33 (4): 317–371. CiteSeerX 10.1.1.534.728. doi:10.1111/j.1475-6803.2010.01278.x. SSRN 1354149. Söhnke M. Bartram; Gregory W. Brown; Frank R. Fehle (Spring 2009). "International Evidence on Financial Derivatives Usage". Financial Management. 38 (1): 185–206. doi:10.1111/j.1755-053x.2009.01033.x. SSRN 471245. Lins Lemke (2013–2014). Soft Dollars and Other Trading Activities. Thomson West. Institute for Financial Markets (2011). Futures and Options (2nd ed.). Washington, D.C.: Institute for Financial Markets. ISBN 978-0-615-35082-0. John C. Hull (2011). Options, Futures and Other Derivatives (8th ed.). Harlow: Pearson Education. ISBN 978-0-13-260460-4. Michael Durbin (2011). All About Derivatives (2nd ed.). New York: McGraw-Hill. ISBN 978-0-07-174351-8. Mehraj Mattoo (1997). Structured Derivatives: New Tools for Investment Management: A Handbook of Structuring, Pricing & Investor Applications. London: Financial Times. ISBN 978-0-273-61120-2. Andrei N. Soklakov (2013). "Elasticity Theory of Structuring". arXiv:1304.7535 [q-fin.GN]. Andrei N. Soklakov (2013). "Deriving Derivatives". SSRN 2262941. "European Union proposals on derivatives regulation – 2008 onwards"